Artifice: 2013 Halloween Bonus Episode! Episode Two now on B&N! I’ve updated the links to the right to reflect the new retailers. Google Play & iBookstore: Taking extremely long to process compared to Episode One. Am currently checking to see if there is a problem. Amazon: Holding pattern until B&N is up. First, let me apologize for the lack of recent updates. Secondly, I’ve just received the final revision back from my editor, and am giving it one last once-over tonight and tomorrow. Ideally, I’d prefer to let it sit for a week, then give it one last read to see if I missed anything. However, I know you guys have been waiting a long time for this. To that end, sometime tomorrow evening or Monday, I’ll start the process of publishing the book online. Smashwords.com: Book will be available here immediately in all formats. Google Play: Should be up almost immediately. Possibly a delay of a day or two. Apple, Kobo, B&N: Possibly a delay of up to a week. Amazon: Will not be available until it’s already been posted on Apple and B&N. Possibly a delay of up to a few days after that for it to be pricematched to free. Again, thanks for joining me on this ride, folks. I hope you enjoy Episode Two. Well, this is the update I been waiting to write for quite a while now. 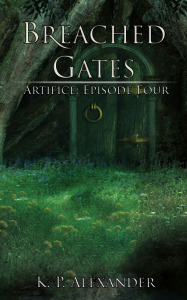 Artifice: Episode One was uploaded last night to Smashwords.com, and is available for free! It’s been a long road so far, but I’m hopefully just setting out. Now that I’ve realized how to spot some of the bumps in the road, it should be a smoother ride for Episode Two. It’ll also be available on Amazon, once it’s been listed on one of those. Maps of the regions in the novel will also be uploaded in short order. With luck, it should be a part of the next Weekly Update. I’m currently compiling a list of places where I can plug my book (for free). If anyone has any suggestions, please leave a comment. Once it’s been listed on all the major outlets, I’ll start an ‘official’ advertising campaign. I think I made the right decision. Well, I hope I made the right decision in delaying the publishing date. Glad to say that Episode One is almost done, and I’ve taken the extra time to flesh out some of the scenes a bit. With any luck, the second draft will be finished Friday night, and I’ll send it off to a few friends to browse over the weekend. Come Monday, I’ll finish the final edits, and will upload it to Smashwords for distribution within a few days. Also, it looks like Smashwords may be a bit backlogged with their vetting process. While the ebook will be available on the actual Smashwords.com site, it may take a week or two to get submitted to Barnes & Noble, Kobo, iBookstore, etc. This will unfortunately impact the Amazon distribution as well. It looks like the only way for a non-distributor to set an Amazon price of $0 is for me to upload it at $0.99, and then wildly click the “Price Match” button on Amazon’s site (they only price match sites such as B&N, Kobo, etc, and not Smashwords.com unfortunately)… and hopefully it will be updated within a few days at most. I can upload it to Amazon at the same time that I submit it to Smashwords, but I’ll feel pretty bad if someone actually buys it before I can set the correct ‘price’. Hopefully, by Christmas (or the Mayan Apocalypse), this will all be sorted out. Oh, and Episode One is now clocking in at 31,000 words, with only the last (tiny… hopefully) chapter left to write. Just a quick update before heading to bed. Wasn’t able to accomplish much writing today, but did manage to pass the 20,000 word mark – am now clocking in at just over 20,200 words. Contacted someone regarding the cover art – will have an update on that later this week. It will be released on Amazon, but that may be delayed a few days – reason being that Amazon doesn’t seem to allow an easy way for you to list a free ebook, so will have to work that out. Now released, and available at all major retailers! Absolutely hate coming to my site, but want to know when the next book is released, or if I'm running any cool contests? Subscribe to this mailing list to get updates straight to your inbox! Note that you'll get an email whenever I post something inane (or otherwise) here. If you only want emails whenever new episodes are released (or when there's a contest or giveaway happening), then please subscribe to the "Mailing List" instead (further up on this page).